A Frenchman has been found guilty of murdering four people at the Brussels Jewish Museum. Mehdi Nemmouche, 33, shot dead two Israeli tourists, a volunteer worker and a receptionist in May 2014. Prosecutors said he fought in Syria for a jihadist group before returning to Europe to carry out the attack. The two-month-long trial involved apparent witness intimidation and testimony from former prisoners of the Islamic State group in Syria. A second man accused of helping to plan the attack and providing the weapons, Nacer Bendrer, was also found guilty of murder. He was previously known to French authorities, having served five years in prison for robbery. He is said to have met Bendrer, who allegedly supplied the weapons in the Belgium attack, while in prison. In the dock the next day, Nemmouche denounced the attempt at intimidation – and the witness, 81-year-old Chilean artist Clara Billeke Villalobos, went on to testify anyway. Ayalet, 19, and Shira, 21, described a mother “devoted to her family” and an unassuming father who “loved to travel”. Listening to the testimony in the dock, Nemmouche remained impassive, looking away. Belgian newspaper Le Soir described it as showing an “arrogant” Nemmouche in front of police with a “disdainful smile”, arms folded. He repeats his right to remain silent again and again, barely managing to suppress a smile. “This video stinks of bad faith and sweats guilt,” the lawyer representing the museum, Adrian Masset, said. Two of them appeared in court – pointing out Nemmouche as their captor. He described him as “sadistic, playful and narcissistic”. His colleague, Didier Francois, told jurors Nemmouche had beaten him dozens of times with a truncheon. But Nemmouche’s lawyers said that the journalists’ testimony amounted to a “stunt” and a “trial within a trial” because their kidnapping is the subject of separate proceedings in France. 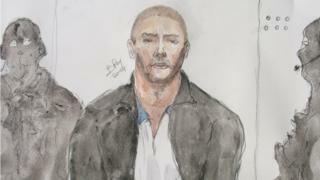 He told the court Nemmouche was “not simply radicalised but ultra-radicalised”. “For the killer, for Mehdi Nemmouche, the identity of the victims mattered little,” he added. The closing argument from the defence was described by some as “mind-boggling”, as it wove a web of conspiracy involving foreign intelligence agencies and assassination. Mr Courtoy, Nemmouche’s lawyer, suggested that his client was recruited in Lebanon in January 2013 by Iranian or Lebanese intelligence to join the ranks of IS. But this claim went unsubstantiated by anything concrete. According to Courtoy, the murder was not an IS attack, but a “targeted execution of Mossad agents” – a reference to the Israeli intelligence agency, which he claimed the Israeli couple belonged to. The killing was carried out by an unknown person, he said. He said Nemmouche “went off the radar towards the end of 2013” after British jihadists suspected him of “engaging in double- dealing”. Upon his return to Europe, he supposedly tried to quit the spy group, “which was simply trying to use him”. “Do these people really belong to Iranian intelligence?” Mr Courtoy mused. “You can see in any case that they are active in Brussels, France, that they have plans to kill people,” he said. “This is a case of state terrorism”, he added. Then, Mr Courtoy explained that he couldn’t give further clarifications because he didn’t “want to have an 80-second episode” in his own home – a reference to the 80 seconds it took the killer to carry out the attack at the museum. He implored the jury to “not make a mistake” by convicting Nemmouche, repeating he had been “set up”.